Joining the Pilot Team is Mason KM4SII from Clemmons, South Carolina. Mason, an avid DXers, is 15 years old. In 2017 he operated from Iceland as TF/KM4SII, in July 2018 he will operate from Curacao as PJ2/KM4SII. Mason will work with NA and Chief Pilot Glenn KE4KY. Joining our list of corporate sponsors is Rig Expert Ukraine Ltd (https://rigexpert.com/). Rig Expert is a recognized leader in the development, production and global sales of antenna analyzers, transceiver interfaces, ARDF equipment and amateur radio software. They have donated 2 Model AA 55 Zoom Antenna Analyzers to the project. We appreciate the confidence that Rig Expert, and our other corporate sponsors, have shown in the VP6D team and the Perseverance DX Group. Team member Arnie Shatz was presented a Meritorious Service Award at the International DX Convention Visalia, California. Presenting the award was Mel Hughes, K6SY President Southern California DX Club. SteppIR Communications Systems is providing two 2 element Yagi antennas. 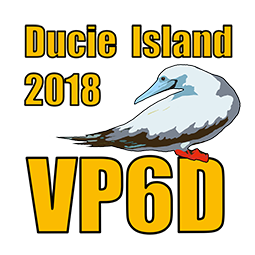 These antennas proved to be indispensible during our TX3X Chesterfield Island project; we’re happy to have them for VP6D and appreciate SteppIR’s continued support.